FBI photos of Boston bombing suspects: Reddit got it wrong. Now That the FBI Has Suspects, Will Reddit Help Track Them Down? 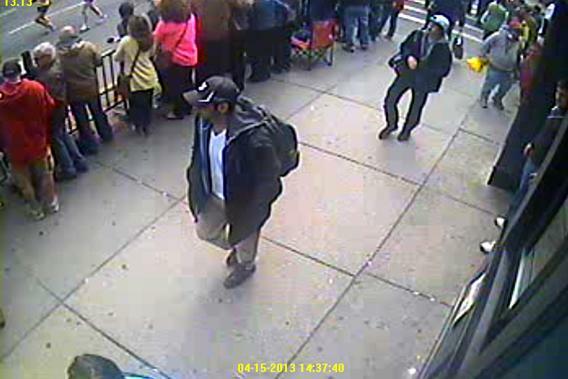 The two men the FBI has identified as subjects of interest in the Boston bombings were not among the primary people that armchair Internet detectives had flagged as suspicious. UPDATE, 11:22 p.m.: Now that the professionals have given them something concrete to work with, Reddit’s cybersleuths are moving on to the next phase of their shadow investigation. This one already shows signs that it might be more fruitful than the first phase, which was sort of like trying to play “Where’s Waldo?” without having any idea what Waldo looks like. No, the Reddit hive has not yet tracked down the culprits, though it does seem to have a positive ID on one of their hats. And several Redditors have posted additional photos that show people closely resembling the FBI’s suspects. Perhaps the most disturbing is one that seems to show a man who looks a lot like the FBI’s Suspect No. 2 in the background and 8-year-old bombing victim Martin Richard in the foreground. If authentic, it’s a haunting image. Whether any of this will be of help to authorities is unclear. In his press conference Thursday afternoon, FBI Special Agent Richard DesLauriers said the images released publicly by the FBI were “the only photos that should be officially relied upon in this investigation.” Still, I’d bet the FBI has at least one or two agents keeping an eye on r/findbostonbombers, just in case. Original post, April 18, 6:33 p.m.: Over the past three days, the armchair detectives on Reddit’s findbostonbombers message board have worked their way through all the people with backpacks in all the photos they could find of the area around the Boston Marathon finish line, looking for possible suspects in the bombing. First they got excited about “Blue Robe Guy.” Then there was a second backpack guy. Then there was blue tracksuit guy, who ended up on the front page of the New York Post. (To be fair, that’s the Post’s fault, not Reddit’s.) By the time the FBI released pictures and video of the two guys that really are potential suspects, Redditors had gone through so many “guys” that it was no longer possible to keep track of them all. And yet, as far as anyone can tell so far, they were all wrong. It’s conceivable that one of the people flagged on one of the less-prominent Reddit threads, or on a similar photo dump on the underground message board 4chan, could still turn out to be a match with the suspects in the FBI’s photos. But if so, Redditors themselves haven’t found it yet. And many are beginning to suspect that they were all red herrings. Every single one.